Kyodo News, AP Sarah Hendrickson of the United States soars in the air during the second event at the women's World Cup ski jumping on Saturday in Zao, Yamagata Prefecture, Japan. Brace yourselves, the Winter Olympics are coming, and I can't wait. I absolutely love the Winter Olympics and I will watch all the events I can. Which is kind of odd since I can't sit through five minutes of the Summer Olympics. Maybe because I grew up in Northern Wisconsin playing hockey, or it's my Norwegian heritage. Most likely it's because I just hate running. At any rate, the Winter Games is where it's at for me. 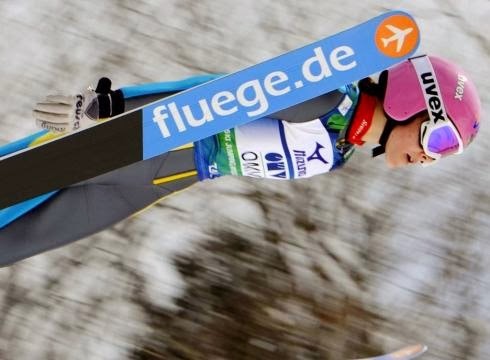 While watching the NFL playoff games last week, they ran a commercial promoting how this year Women's Ski Jumping will make it's debut as an Olympic Event. That announcement shocked me. Not because I think women can't handle the sport of ski jumping. I just assumed it always was an Olympic Event. There have (as long as I can remember) Women's divisions for Downhill, Super G, Bobsled, Luge and all the other death defying events that I think have their origins to a drunken dare between two Scandinavians. Especially Skeleton. There is no way that sport started off sober! You know there was a few Swedes and Norwegians at the ice track bragging how fast they were, then some Finnlander went down head first to prove a point.